It's hard to believe this sweet and tasty treat is diabetes friendly! 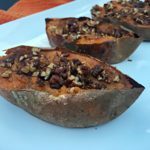 Sweetened with stevia a little bit of brown sugar and the natural sugars of sweet potatoes, this recipe will satisfy your taste buds without spiking your blood sugar. Prick sweet potatoes with a fork and place on baking sheet lined with aluminum foil. Bake until soft, about 45 minutes. Once cooled enough to touch, cut each potato in halfway lengthwise. Scoop out the flesh of the potato and place in bowl, leaving enough space around the edge for the potato to hold its shape. Mash the potato flesh, add cinnamon, heavy cream, and stevia (if desired) and mix until well combined. Spoon potato mixture into the potato skins and sprinkle with cinnamon. Reduce oven heat to 350 degrees F. Place sweet potatoes back into the oven until heated through, about 15 minutes. Top with candied pecans and serve. Preheat oven to 325 degrees F. Line a baking sheet with aluminum foil and spray with cooking spray. In a small pan, melt butter over medium heat. Add brown sugar, vanilla, and salt and mix until well dissolved. Add pecans and turn to coat sugar mixture. Spread onto prepared baking sheet. Bake for 20-25 minutes, stirring every 10 minutes. Remove from oven and spread on wax paper to cool.